ResponderSafety.Com Breaks New Ground in Distracted-Driver Effort! Home > News > ResponderSafety.Com Breaks New Ground in Distracted-Driver Effort! ResponderSafety.Com is equipping public information officers (PIOs) and public educators with new tools to get the message out to the public about the dangers distracted drivers pose to emergency responders operating on the roadway and safe driving practices when approaching and passing roadway incident scenes. Every year, dozens of responders from fire, law enforcement, EMS, DOT, safety service patrols, and towing and recovery are killed and many more injured when they are struck by passing vehicles at roadway incidents. These deaths and injuries are preventable. For well over a decade, ResponderSafety.Com has been working to train responders how to improve their safety practices during roadway response. Progress has been made toward improving adoption of these safety practices and reducing struck bys. However, there has been a missing piece of the puzzle — motivating the public to exercise due care when approaching and passing emergency scenes on the roadway. ResponderSafety.com is taking up this challenge with a new page of resources and information specifically for PIOs and public educators to use to educate the public about what to do — and not do — when emergency responders are present on the roadway. 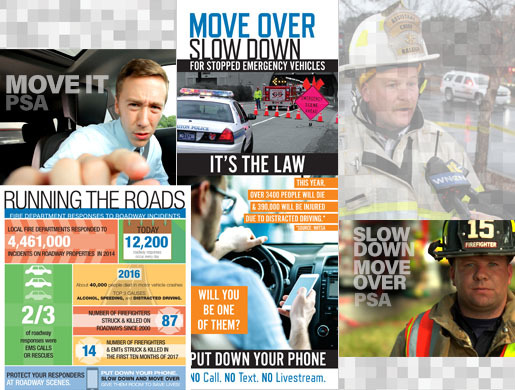 The page includes video PSAs, media advisory templates, sample media contact emails, downloadable resources including a push card, a press packet, a backgrounder for leadership, new stories and case studies on struck by incidents, free training modules, and much more to help PIOs and public educators communicate messages like Move Over Slow Down, Move It (Fender Bender laws), and anti-distracted driving. ResponderSafety.com has partnered with the National Fallen Firefighters Foundation, the National Law Enforcement Officers Memorial Fund, and the PA Fireman magazine to promote this page and its resources. The new page builds on a successful pilot program in Pennsylvania and Maryland where first responders engaged with the public and directly at Visitor Centers and explained how distracted driving was endangering responder lives. The new page debuts during National Traffic Incident Response Week whose theme "We're All in This Together" fits perfectly with ResponderSafety.com's mission to improve safety and traffic incident management for all agencies who respond to roadway incidents. During this week, departments are asked to examine and redouble their efforts to teach each other and the public about traffic incident response issues. "Our timing is perfect," said Jack Sullivan, Director of Training for ResponderSafety.com. "We've been working on safety and traffic incident management issues for a long time within the responder community and it became clear to us that, to truly reduce the number of struck by incidents to zero, we needed to involve the public as an active partner. This PIO information page does just that — we are putting public education tools in the hands of our education and communications specialists who can carry safe driving messages into their communities. If the public takes these messages to heart, our responders are going to be a lot safer and we are going to have fewer traffic fatalities for motorists as well." Departments in all disciplines are encouraged to check out the new resources page at respondersafety.com/PIO. If your department's jurisdiction includes a rest area, service area, or travel plaza, reach out to ResponderSafety.com by emailing CVVFAResponderSafety@yahoo.com so we can help you plan an event where responders engage with the public and distribute printed educational materials on distracted driving and responder safety and/or provide you with a video loop of safe driving messages that can play on service area televisions. Respondersafety.com and The Responder Safety Learning Network are projects of the Emergency Responder Safety Institute, a Committee of the Cumberland Valley Volunteer Fireman's Association. The Emergency Responder Safety Institute (ERSI) serves as an advisory group of public safety leaders and transportation experts committed to reducing deaths and injuries to America's emergency responders ERSI is dedicated to the safety of these men and women by engaging in and promoting activities that include developing educational material to support responder safety training; promoting the National Unified Goal (NUG) for Traffic Incident Management (TIM) including responder safety; safe, quick clearance and interoperable communications; encouraging the development of TIM Teams, promoting collaboration, communication and cooperation among the nation's emergency responders and keeping emergency responders up to date on national rules, regulations and trends related to safe roadway incident operations.